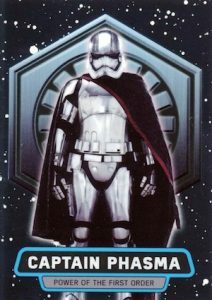 2016 Topps Star Wars The Force Awakens Chrome takes the popular primary TFA design and gives it a chromium treatment. Each hobby box features one autograph, sketch, relic, medallion, or printing plate. The base set keeps things on the more moderate side with 100 cards. Several Refractors come into play with six parallels, including basic Refractors (1 per pack). Exclusive to hobby, more options include Prism Refractors (#/99), Shimmer Refractors (#/50), Pulsar Refractors (#/10) and Superfractors (1/1). 2016 Topps Star Wars The Force Awakens Chrome premium hits include Base Autographs, Dual Autographs (3 cards) and Triple Autographs (2 cards). Base autograph parallels include Prism (#/25), Shimmer (#/10), Pulsar (#/5), Superfractors (1/1) and Printing Plates (1/1). There are also limited Sketch cards. 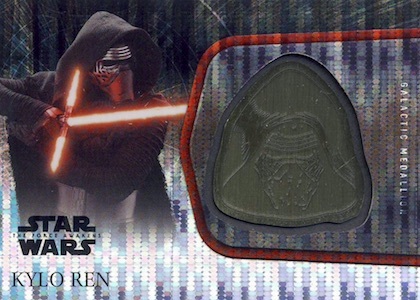 On the memorabilia front, 2016 Topps Star Wars The Force Awakens Chrome manufactured Medallion Cards offer Bronze (#/50), Silver (#/25), Gold (#/10) and Platinum (1/1) parallels. Beyond the base set, set collectors also have four inserts to chase in Topps Star Wars The Force Awakens Chrome. 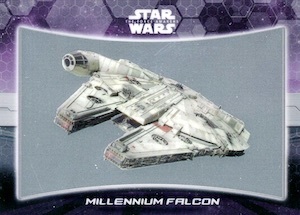 Among the choices are Behind The Scenes (1:4 packs), Heroes Of The Resistance (1:2 packs), Power Of The First Order (1:12 packs) and Ships & Vehicles (1:8 packs). While there are not quite as many parallels as the base set, inserts include hobby-exclusive Shimmer Refractors (#/50), Pulsar Refractors (#/10) and Superfractors (1/1). 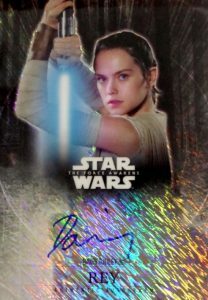 2016 Topps Star Wars The Force Awakens Chrome Daisy Ridley Rey Pulsar Auto 4 5! PARALLEL CARDS: Refractor (1 per pack), Prism Refractor #/99 (Hobby), Shimmer #/50 (Hobby), Pulsar #/10 (Hobby), SuperFractor 1/1 (Hobby). 30 cards. *11 subjects only have parallels and not base autographs. * Ridley is only in Hobby packs. PARALLEL CARDS: Atomic Refractor #/99, Prism Refractor #/50, X-Fractor #/25, Shimmer Refractor #/10, Pulsar Refractor #/5, SuperFractor 1/1, Printing Plates 1/1. 5 cards. Serial numbered #/3. Hobby only. 4 cards. Serial numbered #/3. Hobby only. PARALLEL CARDS: Shimmer #/50, Pulsar #/10, SuperFractor 1/1, Printing Plates 1/1. All insert parallels are exclusive to hobby. PARALLEL CARDS: Bronze #/50, Silver #/25, Gold #/10, Platinum 1/1. 27 cards. Target only. Serial numbered. PARALLEL CARDS: Shimmer #/50, Pulsar #/10, SuperFractor 1/1. Good: Strong autograph checklist (Rey! 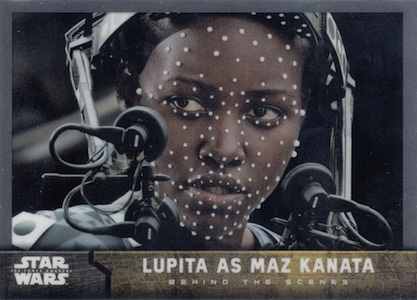 ), Chrome really pops on the base movie scenes (especially Refractors). Bad: Most of the key autograph names are short prints, inserts are not the greatest use of Chrome. 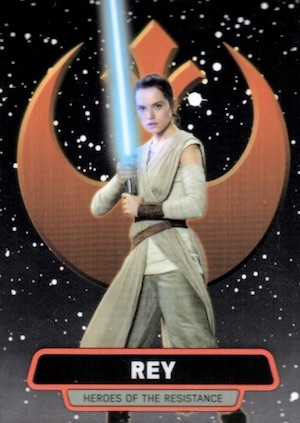 The Bottom Line: 2016 Topps Star Wars The Force Awakens Chrome is a fun release that looks good and gives collectors a small shot at Daisy Ridley autographs. Beyond that, there is nothing specific to draw additional interest but the release is a solid option for TFA fans. To me, the first thing that jumped out was how good the movie scenes looked on Chrome. 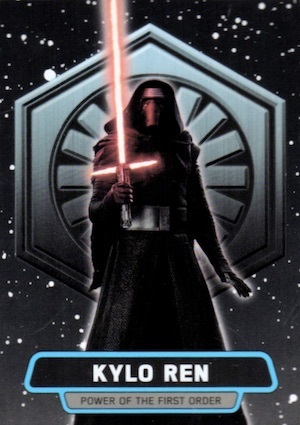 Basically a chromium variation of the Series 2 design, I admit I don’t fully understand putting a small image of Kylo Ren on every card but it’s not really that noticeable after a while. Even more impressive are the Refractors, which add an extra shine/brightness that enhances the look even more. Marked as Refractors on the back of the card to help collectors spot them, they are quite plentiful at one per pack. I would have liked to have seen a little more Refractor variety in the box as that is something I normally associate with Chrome. All the other parallels beyond base Refractors are numbered to 99 or less, so they are much tougher to pull. This brings us to the inserts which did not really work as well for me. Behind the Scenes is probably the best and I liked the background look at the movie. 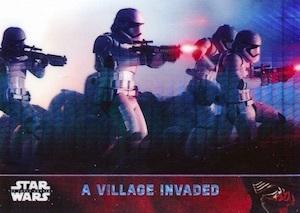 On the less appealing side, Heroes of the Resistance and Power of the First Order are inserts that have been repeated several times over the course of TFA card sets. Sure, the images have changed, but they just feel stale at this point. 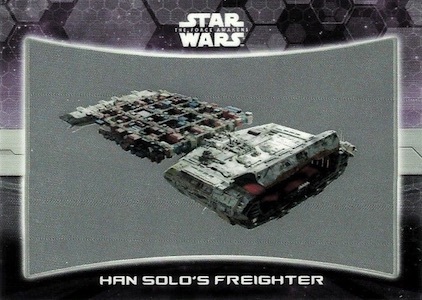 Ships & Vehicles is the only really “new” insert but the large frame border and airbrushed background is a waste of chromium, in my opinion. Personally, I would have liked more insert options in the checklist. If they were wanting to carry over previous inserts sets, there are plenty of others which would have looked much better in Chrome. Character Montages from Series 1 and Character Posters from Series 2 come to mind. 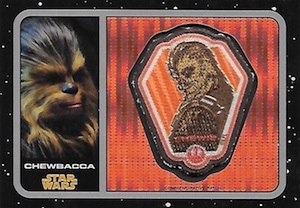 On paper, 2016 Topps Star Wars The Force Awakens Chrome is a set for the ages. The site of the first Star Wars autographs for Daisy Ridley as Rey, this is even more impressive given the hard-signed format for her cards. And Rey is not the only autograph of note as Harrison Ford, Carrie Fisher, John Boyega, Mark Hamill and Andy Serkis are also included among the possible signatures. However, the big caveat is that all of these big names (and a few others) are short prints that don’t have base autographs. 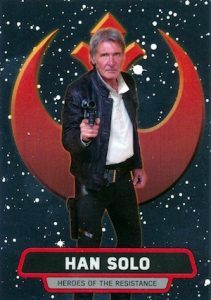 While they are all found in the release — Rey is only in Hobby — this means the odds are greatly stacked against you. Because there is no depth to the autograph checklist, the common signatures are mostly characters with very small roles and screen time. Of course, this also means they have little value. Also, while they were intended to be in the set, the base short prints were ultimately not included and this was something that would have made an intriguing chase and helped add value. 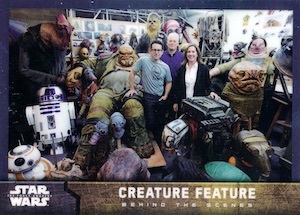 Costume Relics from The Force Awakens were also removed. One hit per box with a price tag that runs around $70 is tough when you know how limited the top signers are. Because the cards look good and building the set is manageable, this can make the price easier to stomach. Still, the value is tough to recoup unless you hit one of the SP autographs. The numbered Refractors do help some, especially for a key scene. This is one to keep an eye on as prices are likely to soften over time given that there was a large production run. I’ll admit that I am (and always have been) partial to Chrome. This made the box experience much more fun. I even pulled an autograph in my box to go along with a stack of inserts and parallels to sift through. If you liked the movie or are just a huge Star Wars fan, this is a set worth checking out as long as you realize how just unlikely it is that a Rey autograph is in your sealed box, waiting to be uncovered. 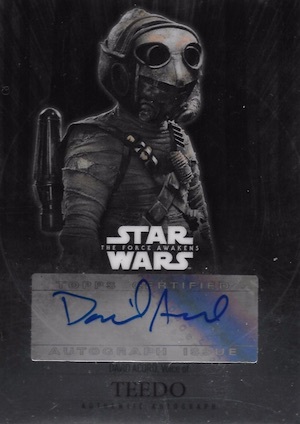 Star Wars Force Awakens Chrome Prism Autograph Card CA-GG G Grunberg as Snap W.
The dual and triple autographs almost certainly will not have those parallels. They will most likely just have one version and each be serial numbered out of 3. Jestin Haugh � You are correct. That was carried over by mistake from the Base Autographs. So they 10 signers with the * are confirmed by Topps that only have parallel autos? A few like Ford and Ridley are a given, but a few are surprising to me that they are. Jestin Haugh � That info came straight from Topps. Looks like I missed 1, looks like 11 signers with no base autos! Jestin Haugh � Yep, 11 without base autographs. Certainly not ideal but I appreciate that they disclosed it ahead of time. It appears that all of the Target Patches are serial numbered. I thought I had a special refractor version because it was numbered, but the early birds on eBay all appear to have a serial between 400-800, with the refractors being on a more limited basis /199 or less. Can anyone confirm that for me – experience/notice the same? Hey guys, I bought a Blaster of this from Target and pulled a BB-8 Patch. I didn’t think much of it until I saw it was 2/5. I know they are all numbered and the lowest I have ever hit on any serial numbered card was /25 but Im hoping I hit something good! any help would be appreciated! Thx! These cards are really nice looking. You hit a Superfractor, the lowest #’ed patch you can get! They are not 1/1’s, but still a great hit. Should be over $100! Are there two different types of unnumbered refractors? The ones I’m pulling from Blaster Boxes are different than the ones I’m getting from e-bay to complete the set. Both say “refractor” on back, both are not numbered, but one definitely has a different background refractor pattern from the other. Can you help? Found my answer. There are wave refractors in retail packs only. Another great product, love the Chrome. 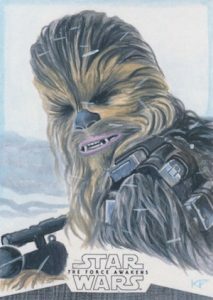 Come check out our group on FB: “Topps Star Wars Trading Cards Smugglers, Merchants and Traders” so we all can trade and avoid ebay while helping other collectors.